Your furnace is important to keeping your home comfortable. It provides you with a way to keep warm during cold weather. When it doesn’t work, it can be difficult and expensive to replace. However, there are times when it seems to work, even if you know it needs something fixed. Timely repairs are important to making sure that your system runs efficiently and is safe for your home and family. When something in your furnace isn’t working, other parts may try to do a job they aren’t meant for. They work harder and have more opportunity to break down, creating a larger and more expensive problem to fix. Even if other parts of the furnace continue to work fine, your monthly energy bill could see a dramatic increase due to inefficiencies inherent in a damaged system. 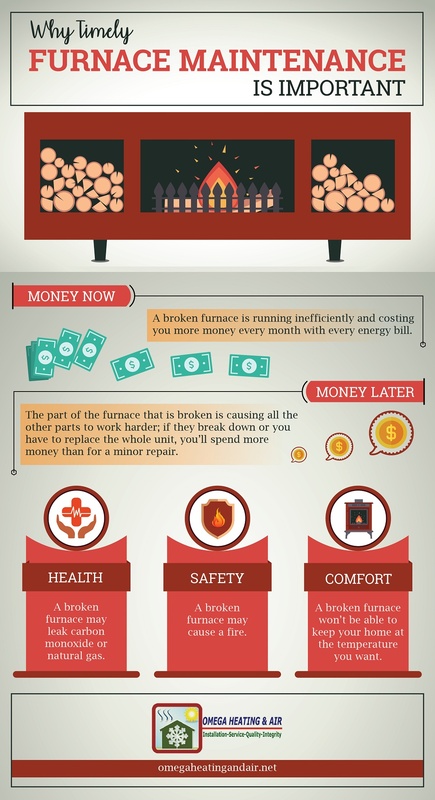 If money were the only worry about a furnace that needs repair, you might not be too concerned. However, a broken furnace can be hazardous to your health and the health of your family. Carbon monoxide is odorless and tasteless, so unless you have CO detectors, you won’t even know you’re being poisoned. Gas leaks are more detectable because of the smell associated with them. That doesn’t make them any safer because a gas leak and a broken furnace could combine to create a fire. Of course, if your furnace needs repair, it probably means that it’s not doing its job properly. A furnace is supposed to help keep you comfortable; timely maintenance and repairs will allow it to do so. With over 15 years of experience, Omega Heating & Air has been providing Georgia with HVAC services to keep everyone comfortable regardless of the temperature outside. Our friendly and professional team always looks for the best way to make sure you get the most out of your HVAC system. If you need a job done the right way, we’re the people to do it. Contact us today and schedule a service appointment for your furnace, air conditioning, and HVAC system. We look forward to helping you get more efficiency from your existing system or getting a new system installed for your future comfort.